You may have noticed a new look to your CDPS colleague’s ID badges -- or, indeed, to your own. The Department is well on its way towards implementing badges that are standardized not only across the Department, but aligned with agencies throughout the entire state and many portions of the country. The Division of Homeland Security and Emergency Management (DHSEM) launched the “Salamander” project in 2014 to deploy a statewide, standardized identification system for first responders and state agencies. In July 2016, we began implementing the system within CDPS. Thus far CBI, DCJ and DHSEM have reached 100% or near-complete deployment of the system; the EDO, DFPC and State Patrol are in various stages of collecting and cleaning up data in preparation for the rollout. “The goal is to have a standardized identification system across all levels of government and all levels of response,” said Jeremy Utter, Logistics Section Chief for DHSEM and manager of the project. 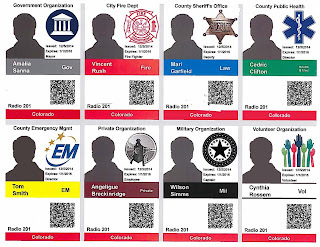 Standardization makes it easier to quickly identify credentialed staff and their roles because all ID badges have a similar look and informational layout. Having all agencies on the same credentialing system makes multi-agency staffing tracking more efficient: anyone from an agency already using Salamander can simply swipe their existing badge to check in or check out of an incident, while those without a Salamander badge can have one printed on-site. Finally, and perhaps most importantly, “it enhances accountability -- not only for safety, but also financial accountability,” Utter said. Individuals working an incident can easily check in and check out via the web-based system, enabling the state or local incident command to track hours contributed and who is currently on the job. As of Feb. 24, DHSEM has successfully enrolled 14,130 Colorado personnel in the Salamander system, representing about 1,000 agencies. Most of the agencies are local emergency response organizations, including governmental agencies and nonprofits. Read more about the New ID badges and their benefits from our initial announcement.